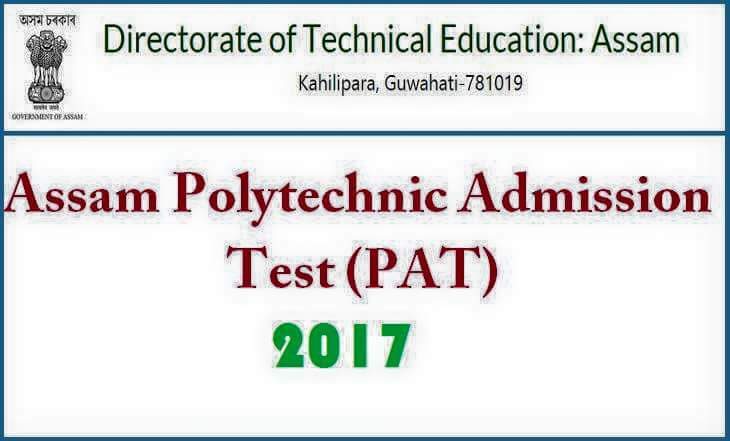 Online applications are invited from the candidates who are permanent Resident of Assam for appearing in the Polytechnic Admission Test [PAT] 2017 for admission into Diploma courses in the following Polytechnics of Assam/outside Assam (against seat allotted by Govt. of India) the session 2017-18.
a) 40% marks (average) in Mathematics and Science for General Candidates. b) 35% marks (average) in Mathematics and Science for Schedule Caste Candidates. c) 33% marks (average) in Mathematics and Science for Schedule Caste Candidates. b) Candidates should be born on or after 01-08-1994 for SC/ST Category. c) For Institutions outside Assam [Seats allotted by Govt. of India]. Upper age limit is 21 years as on 01-08-2017. How to Apply: Candidates are requested to apply online by logging into www.dteassam.in and click on “Online Application for PAT-2017”. The “Online Application will start from 20-03-2017 and will be open till 05-05-2017. Candidates are requested to read the instructions mentioned in the Downloadable Information Brochure before filling the Online Application Form. Types of Question: Multiple Choice Questions. Candidate without Permanent Resident Certificate (PRC) will not be allowed to take admission even after clearing Polytechnic Admission Test-2017. So, candidates are requested to keep the PRC ready well in advance of the admission process.